Russian carrier Saratov Airlines is interested in acquiring Japanese-made MRJ90 regional airliners, reads a statement on the operator’s website. Saratov Airlines CEO Alexei Vakhromeyev and representatives of Mitsubishi Aircraft Corporation representatives met for the third time this year on October 25. The first such meeting had taken place at Paris Air Show; the second one, at the MAKS exhibition outside Moscow. “During the visit to Saratov the Mitsubishi Aircraft delegation was presented with the airline’s fleet renovation strategy,” the carrier’s statement reads. No details were immediately available. 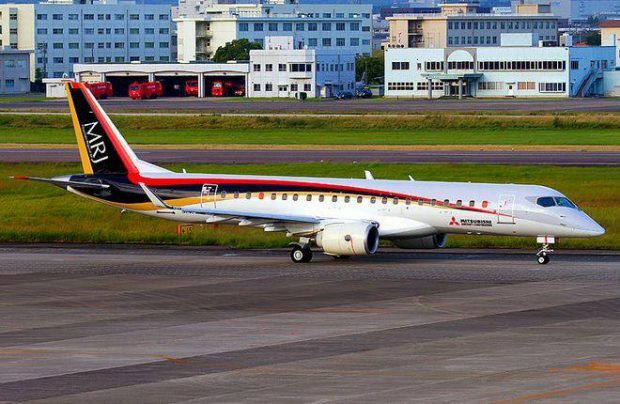 The MRJ90 is designed to carry 88 passengers. The development program is massively behind schedule; according to the latest reports, commercial operation is to begin in 2020. Saratov Airlines’ fleet includes Ukrainian-designed 85-seat Antonov An-148 regional jets, which were leased for five years in late 2016. Initially, the An-148s were expected to replace the carrier’s aging 120-seat Yakovlev Yak-42Ds, but the airline continues to operate the later type. It also has two 120-seat Embraer E195s, and is planning to add another two in early 2018.